Have you looked at a kids’ book lately? Before you hit Publish, take a minute to haul a few kids’ books off the shelves. If you don’t have any, go to the library and bring some home. Let’s look at them together. What are we looking for? Bear with me, because we, my friend, are looking for secrets that will rescue your book from the morass of terrible self-published children’s literature out there. Okay, I call it literature here to be nice. It isn’t always; sometimes, frankly, it’s just books. There are 5 main things you’ll want to look in that stack of REAL, professionally published children’s books that will save you a ton of heartbreak if you’re self-publishing and getting your own book ready to print. This will take a little time up front, but you’ll thank me, really you will, when your book comes out looking nice and professional in the end. How big is the book? Certain sizes are standard for kids’ books. Certain sizes are not. Although 6x9 is a popular size for self-published adult books, kids’ books tend to be chunkier and square. I like 8.5”x8.5”, but that means setting up the actual page size to be 8.63”x8.63”, if I want the page colour and/or images to extend right to the edge (full bleed). Here’s a typical 2-page spread from my book Zoom! A Trip to the Moon. To me, this 8.5 x 8.5 size feels “right”. Not too big, not too small. Measure the book you’re holding and see how big it is. Measure a few more for comparison and see which feels more like a book. You’ll also need to check which sizes are available with your printing company, of course. I’ve already talked about the quality of the pictures (see my Three Deadly Sins). But you also have to make sure there are enough of them. Don’t skimp; if you’re self-publishing a children’s picture book, you need at least one big, striking, colourful picture on every two-page spread. Of course, there are exceptions… but you should assume you’re not one of them. Here’s a typical 2-page spread from my book Ezra’s Aliyah, about a boy whose family is moving to Israel. Flip through the library (or another book) that you have in your hands and see how the illustrations are laid out. Are they large, or small? Does the text wrap around and through the illustrations, or is it laid out on separate pages (easier for self-publishing and ebooks, but slightly more amateur looking – like mine; hey, I’m an amateur). Most kids’ books don’t start on page 1. Yet I just opened one of my first self-published books and what do you know – that’s exactly where it begins. Uh-oh… time to think about revising that one, just a little. I didn’t know better when I first got into this racket, but now I do, and so do you. Open that book and see what appears on each of the first few pages. You might see a title page, half-title, dedication and copyright page. Your book should have some of these. And don’t number those extra pages, either! It’s up to you whether to begin on Page 4 (the back of a page, appropriate for a 2-page spread with a full illustration) or Page 3 or 5 (whichever is the first facing-forward page after the copyright stuff). This is a matter of taste, and usually something the book designer decides. Not the end of the world, either way. Just decide what’s best for your story. As for what goes on the copyright page… the answer is, as little as possible. Here’s a typical copyright page from an upcoming chapter book, Yossi and the Monkeys. Take a look at what appears on the copyright and other “preamble” pages in the kids’ book you’re holding. Check a couple of books, if you can. Usually, on the copyright page, you’ll ONLY find copyright information. Not a little “hello” to the reader or anything cutesy, like what I’ve seen self-pubbed writers do. Book publishing is a business; be businesslike. 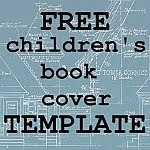 If you’re using one of the built-in cover designers, such as those provided by Lulu or Createspace, you won’t have much flexibility in terms of what you can include on your back cover. Here’s a typical back cover, again from Zoom: A Trip to the Moon. If you have a good quote from a reputable source, do your best to include it on the back cover. You’ll notice the ISBN / bar code area on my cover is blank. I use CreateSpace, which will automatically add the ISBN, so I don’t have to do anything to make sure it’s included. Speaking of ISBNs, though, do make sure (once they’re assigned) that you include them INSIDE the book. A few times, I have almost forgotten to do this. If your publisher doesn’t add the bar code for you, there are several online generators you can use to create it and then you’ll have to paste it onto your cover all by your lonesome. Easier if they’ll do it for you. Who’s judging your book by its cover? Everybody! So it’s GOT to be good. Don’t try to cram everything in. One illustration that shows what the book is about, the title, and your name. NOTHING ELSE. Not a collage of high points from the book. Not bullet points explaining what’s in the book. Not logos or graphics or awards that your readers have never heard of (unless you’ve won a Caldecott or Newbery!). If your books are a series, the covers should reflect that. They should be similar enough that you know they’re “connected,” but different enough to understand the topic of each. Here is Zoom: A Trip to the Moon and its follow-up (not yet released), Baby: Life Before Birth. If you do end up releasing a series, you can always hire a cover designer, after the fact, to create several consistent covers that will tie the books together. You’ll probably notice, from the kids’ book you’re holding – and others on your shelf – that children’s books generally do NOT have a quote on the front cover. No matter how much the reviewers loved your book… don’t clutter it up by throwing their words on the front. Stick it nicely on the back where it belongs. Do you have any other suggestions? Anything you learned the hard way, or figured out from looking at professionally-made books already in print??? As always, you have produced a wonderful chapter new authors can use to create better, professional books for children. I marvel at how much useful information you can pack into a subject. Thanks so much, Earl! This means a lot. This is useful advice for writers. I also see too many books for children that have not been proofread carefully. Best wishes for the spring! I wanted this post to address writers who think their books are DONE. In my mind, that presupposes at least one thorough edit. Sadly, others are less picky. Thank you for your reference. May be someday I can also create a ISBN barcode for my novel and public my own book. Your article give me an encouragement.